What happens if you mistake a funeral parlor for a hotel? I was long overdue for another Aston Martin V8 Vantage adventure, so I jumped at the chance to visit the Nemours mansion in Delaware. The National Capital Chapter of the BMW Car Club of America had an intriguing tour route, leaving from near my home in Catonsville, Maryland and arriving at Nemours, outside of Wilmington, Delaware. Following Deer Creek through Rocks State Park proved to be plenty scenic and entertaining. My 2007 Vantage seemed almost ecstatic at the opportunity for some corner-carving exercise. Thankfully, it tolerates my frequent photo stops without complaint. November is generally a pretty bleak-looking month in the Mid-Atlantic area, but this farm certainly stood out. And, of course, the Aston did its part to liven up the countryside. I parked here in an effort to find what’s left of the once-thriving town of Mill Green, Maryland. It began in 1770, when John Ashmore built a gristmill here, and before long there were houses, a post office, general store, cider mill, and the all-important undertaker’s establishment. Time has marched on throughout most of Maryland, but it has largely stood still here in Mill Green. Farmer John Robinson is believed to have built this house in about 1850. It has been part of an active farm ever since. The original gristmill was replaced by a larger one in 1827, which continued to operate until 1933. Although the mill is situated deep on private property, I was able to get a glimpse of it across Broad Creek. The original wooden gears are still present in the attic. The general store and post office building started out as a residence, built in about 1850 by John Robinson’s son (and using the same general layout). I spotted this abandoned house in the distance and originally thought it was the Mill Green Hotel. My later review shows that it was actually the home and business of Thomas Treakle—town undertaker. Normally, you would want to be very careful not to mix up these two types of establishments; when they’re both out of business, fortunately, it doesn’t make much difference. How did Peddler’s Creek get its name? About 7 miles further along, Broad Creek reaches the mighty Susquehanna River. The waters of both river and creek are considerably backed up by the Conowingo Dam, with the result that Broad Creek looks much more like a lake at this point. It was a beautiful spot, and there were even a few leftover fall colors to brighten the day. Meanwhile, the Aston was running beautifully. The engine pulls strongly from any rpm, although it really thrives above 4,000. The manual transmission shifts perfectly, the steering is tight and precise, and the brakes were always able to counteract the engine’s excesses when necessary. And the car’s 12-year-old original battery still shows no sign of weakness! Driving southeast, parallel to the Susquehanna, I found myself crossing Peddler’s Creek. Was it my imagination, or did the Aston Martin misfire momentarily as it drove over the bridge? Back home, I learned that Peddler’s Creek was originally named Rock Run. In 1763, a local mill owner discovered a body lying near this stream. It was identified as that of an itinerant peddler—a task complicated by the fact that the body was missing its head… A quick burial ensued, with no indication of why the peddler was murdered or where his head might be. My next stop was Berkley Crossroads, Maryland—another town frozen in time. Susquehannock Native Americans had lived here for thousands of years before being driven away by the Iroquois Confederacy in the mid-1700s. By the late 1700s, a community of free African Americans was established, with its own church, school, and businesses. Quaker families also settled in the vicinity and the town prospered, in significant part because the main road from Baltimore to Philadelphia ran directly through the village. In 1928, however, Route 1 was relocated to cross the Susquehanna River on top of the new Conowingo hydroelectric power dam, and Berkley Crossroads was bypassed into stagnation. I had originally planned on taking this tour 2 weeks earlier, but had to postpone due to the press of business. I neglected to brush up on the places I would be visiting, with the result that I mixed up the Swallowfield Mansion with the Auburn Heights Mansion. The latter is open to the public at certain times, and I was thinking I might be able to just drive right on in. So, when I came to Swallowfield, thinking of Auburn Heights, I, uh, just drove on in. Partway up the long driveway, I realized (i) that this mansion looked nothing like what I was expecting, and (ii) this one was actually someone’s private residence—oops! I made a hasty retreat, although not without getting a photo. This once-stately house was built by Maryland State Senator Charles Andrew in about 1895. To entertain his guests, the Senator added a sulky racetrack nearby and encouraged them to try out their horses and rigs. Although the house has been vacant and in disrepair for some years, the racetrack may have survived: the 5/8 mile Sinatra Thoroughbred Racing facility at Berkley Farm is only 500 feet from the house and has existed since at least the 1940s. Could it be the Senator’s old track? Cupid Paca (1777-1847) became the first African American landowner in Berkley Crossroads when he purchased 50 acres of property here in 1822. Cupid was a “free man of color” (as the deed records), but his wife, Nancy Prigg, was enslaved. From his earnings as a stonemason and shoemaker, Cupid was able to buy his wife’s freedom. Free African Americans in Maryland did not enjoy all the same privileges as whites; in fact, it wasn’t even close. For example, by law they could not leave the State for more than 2 weeks without forfeiting their freedom. An African American farmer couldn’t sell farm goods to anyone unless he had “a permit … from a justice or from three responsible persons in his neighborhood that he was believed to have acquired the goods honestly.” A black resident of Maryland couldn’t even own more than one dog (again by law). Cupid Paca left his land and possessions to his children Joseph, Cupid, Jr., Jacob, Ann, Margaret, and Robert. (Another daughter, Charlotte, had been paid $500 by a wealthy white landowner to leave Maryland and never return. This was a lot of money in 1831, roughly equivalent to $12,000 today, but the reason for this transaction appears to be lost to history.) Joseph sold a portion of the land, for use as a lot for a schoolhouse. The resulting Hosanna School served the Crossroads’ African American children from 1868 to 1945, despite an order of condemnation in 1907. After the school closed, the building was used as a community center. Hurricane Hazel failed to destroy the schoolhouse in 1954, although it carried away the entire upper story. The Hosanna School was renovated in 1990 and is now a museum. This once-majestic tree in the schoolyard may also have been a victim of Hurricane Hazel. Remarkably, it has survived the loss of most of its trunk and main branches. I took this photo of the Aston Martin and surrounding countryside because I liked the contrast between the shiny car and the leaden sky. It turns out that the house in the distance was the home of Cupid Paca. (Where’s a historical marker when you need one?) Underneath the siding, it’s all log cabin. Anyway… As many of you know, I have a theory that anyplace in the Mid-Atlantic area was the site of something of historical significance. The Rigbie House is further evidence. The stone portion was built in about 1730 by Colonel Nathaniel Rigbie, who served as High Sheriff of Baltimore County (now Harford County). His son, James Rigbie, inherited the house in 1752 and added the frame portion, including a paneled living room that he used as a courtroom. On Friday, April 13, 1781, during the American Revolution, the 24-year-old Marquis de Lafayette and his army of New England soldiers were camped at the Rigbie House and fields. Gen. George Washington had ordered the Marquis to lead his troops into Virginia as part of a secret plan to surround British Gen. Charles Cornwallis at Yorktown. The soldiers, however, were hungry most of the time, and they had not been paid for months. As a result, many had deserted, and there was talk of mutiny. Gen. Lafayette and his officers decided this would be a good time to try one Walter Pigot for treason, as he had been caught aiding and abetting the British. Having been found guilty, Pigot was summarily hanged from a tall tree next to the McNutt House at Berkley Crossroads. I’m told that the tree still stands, 238 years later, but I couldn’t figure out which was the correct one. (Just as well; I might have run into a Headless Traitor wandering around…) The McNutt house, incidentally, has expanded considerably over the years. Underneath, it too is made of logs. As usual, all this barging around in search of ghosts, racetracks, and spies had put me well behind my intended schedule. Before dashing across the Susquehanna River, however, I had to check out the 1884 Deer Creek Friends meetinghouse. This Quaker congregation was formed in 1734 and built its first meetinghouse 3 years later. Services have been held here ever since. Note the separate entrances for men and women. The white frame addition on the left was originally a stable for horses, but it has since been enclosed for office space. I had crossed the Susqhenanna on the Conowingo dam road many times, but somehow I’d never gotten a good look at the dam itself. Resolving to do so on this trip, I found a “fishing park” a little ways downstream of the dam that offered a good view. The river is nearly a mile wide here, and the dam has been providing hydroelectric power since its construction in 1928. As I walked closer to the dam for a better view, I discovered nearly 100 photographers, all with top-of-the-line telephoto lenses and cameras. I felt distinctly inadequate as I walked up to a couple of them with my puny 16-50mm wide angle zoom lens and Sony a6300 camera and asked if they, too, were there to photograph the Conowingo dam. Well, it turns out that the Susquehanna River, just downstream of the Conowingo dam, is the best place in the continental U.S. to see American Bald Eagles. Who knew? The photographers were on hand from all over the world to catch sight of the roughly 100 nesting pairs that live here year-round, together with many more that winter in this location. As fish come through the dam’s spillway, they become a bit dazed and end up just floating on the surface of the river. There, they make easy prey for the sharp-eyed eagles flying overhead. All my life I’ve wanted to see a Bald Eagle in the wild, and this seemed like exactly the right opportunity! As best I could tell, no one laughed at me as I clicked away with my dinky lens, while everyone else pointed their $10,000 mega-lenses all over creation. One of the juvenile birds (1 to 4 years old) took pity on me and sat on a branch only about 50 feet away. So this photo was about the best I could do. After retrieving my 55-210 mm zoom telephoto, I did a little better with the birds in flight. This was my best picture—except that it’s not a Bald Eagle; it’s just an ordinary ol’ Black Vulture. Still, I had seen many veritable eagles, and I was pleased as punch. The approach to the dam-top road across the Susquehanna is quite a sight. In addition to being scenic, the bridge is toll-free (in marked contrast to the significant tolls on I-95 or Route 40 near Havre de Grace, Maryland). Conowingo, by the way, means “at the rapids” in the language of the Susquehannocks. When Captain John Smith visited here in 1608, as part of his mapping of Chesapeake Bay, he named it Smyth’s Falls. The original town of Conowingo now lies many feet underwater—roads, houses, post office, and all. It’s not uncommon to find an old stone bridge that is still in use carrying trains across a stream (Octoraro Creek, in this instance). It’s rather less common, however, to see another railroad bridge crossing the same creek and passing underneath the first bridge. I thought I had only ever seen one such combination previously, but before long I realized that this was the same one. I’d passed this way on a motorcycle trip years ago. The Marquis de Lafayette wasn’t the only French general lending a hand to the colonials during the American Revolution. The Count de Rochambeau was also on the move in 1781, leading his heavy artillery division and supply train toward Virginia for the climactic showdown with Gen. Cornwallis. Rochambeau and his forces camped here at Cummings Tavern on September 9 before fording the Susquehanna the following day. This favorite recess game … required two pieces of equipment—a ball (which might be improvised of string or cloth) and a building with a single gable (such as was common with country schoolhouses). This game, like most others, began with choosing sides… One side then took a position on one side of the schoolhouse, the other on the opposite side. One of the two sides had the ball. A player from the side with the ball then tried to throw it over the schoolhouse, crying at the same time, “Annie Over!” If it fell short and rolled back, the side called out, “Pigtail!,” and tried again. If it cleared to the other side, someone there would catch it. The chase … then ensued. The side that had thrown the ball had to circle the schoolhouse and return to its own side. The side that had received the ball tried to hit players from the other side with the ball as they passed. Strategy was important here: the side with the ball might put it into the hands of an older kid, who was fleet and a good thrower, or it might place it with a younger kid who might not be suspected of having it. Hiding the ball and feinting were good tactics. Anyone hit with the ball was taken into the receiving team. Next that team threw to the other, and so on, repeating until all the players were on the same side. Not quite 5 miles later, I had to stop for a look at the Cecil County Dragway, which had a long line of street “tuner cars” waiting to run the quarter mile. I was a little tempted to see what the Aston Martin could do, but I have too much “mechanical affinity” with cars to subject them to such axle-twisting activities. (Especially with almost 40,000 miles on the original clutch!) I managed to watch a couple burnouts and quarter-mile runs before a Pontiac Firebird exploded its engine and dumped quantities of oil on the track. Time to move on. Safely back on the road and making good time toward the Nemours mansion, I had to stop in just 2.7 miles for a look at the Gilpin’s Falls Covered Bridge—one of only six such bridges still remaining in Maryland and, at 112 feet, the longest of them. It was in active service from 1860 to 1936 and survived a number of floods that destroyed other covered bridges in the area. Following its partial collapse in the late 1950s, the bridge has benefited from major renovations in 1959, 1989, and 2009-2010. After 4¾ hours and 104 miles of traveling toward my destination in Delaware, I finally managed to cross the Mason-Dixon Line from Maryland into Pennsylvania. I know, that’s only an average speed of 22 mph—but, hey, I was taking a lot of pictures! This corner of Maryland had a large Quaker population, largely because William Penn, the governor of Pennsylvania, was anxious to make the area part of his state and invited Quakers to settle there. Lord Baltimore was none to happy with Penn’s action, but the issue of where Maryland stopped and Pennsylvania and Delaware began wasn’t settled until many years later, with the survey by Charles Mason and Jeremiah Dixon. Just outside of Strickersville, Pennsylvania, I happened across the London Britain Friends Meeting House. It was built in 1834 to accommodate local “Primitive Friends” who wanted a more traditional focus than the prevailing Orthodox Quakerism. Membership declined steadily, however, and the meeting was “laid down” (closed) in 1893 when there was only one surviving member. After a long period of disuse, monthly meetings are once again being held here during the summer. Does Aston Martin know how to design beautiful cars, or what? The Marshall brothers were part of a large and very entrepreneurial family in Delaware, and Israel in particular invented a number of devices and processes that greatly improved productivity. Israel (back row, third from left), his wife Elizabeth (middle row, at left), his brother Elwood and sister Mary are shown in this photo at Auburn Heights, together with his parents and various other descendants. Today, Israel’s mansion is part of the new Auburn Valley State Park and houses the Marshall Steam Museum. The museum features the world’s largest collection of working steam-powered automobiles, and it also operates a narrow-gauge railroad. I hope S. Kozlowski didn’t mind that I parked in his spot. This area is now part of the Auburn Valley State Park and will be repurposed into, well, something. In the meantime, no one seems to mind if you wander around a bit and take pictures. Despite the collapse of the NVF Company, vulcanized fibre is still manufactured world-wide and used in a wide range of products. The Garretts were another industrial family in this area. John Garrett, Sr. started out with a gristmill in 1731, which his son John, Jr. converted to a paper mill when they could no longer compete with the big flour plants in Wilmington. In 1782, Jr. sold the paper mill to Thomas Marshall (Israel’s father) and started the Garrett Snuff Mill. Snuff had become very popular in America and Europe, ever since Queen Catherine de’ Medici of France discovered in about 1560 that the powdered tobacco would cure her frequent headaches. Europeans generally inhaled the stuff, while early Americans would “dip” it (i.e., place snuff in their mouths. The Garrett company grew steadily as new mills were added, eventually totaling five, along with warehouses, offices, and other facilities. By 1901, Garrett was responsible for one-fourth of the entire U.S. production of snuff. These were two of the warehouses. The Garrett Snuff Mill passed to new ownership in 1907, but it was still operating with 1880s’ machinery. The company folded in 1954, and other businesses made use of some of the vacant buildings. Today, the Dew Point Brewing Company is the only remaining active business, producing a variety of craft ales and operating a small pub in the upstairs of the smaller building in this photo. After roaming around and getting this photo from the old snuff loading dock, I decided that the Vantage looks superb from any angle. Having looked around the “upper” snuff mills, I drove around to see the ruins of the lower snuff mill. I found the railroad tracks that crossed Red Clay Creek, and also the dam that provided water power to the lower mill, but there was precisely nothing left of the mill itself. In a desperate effort to reach the Nemours Estate before closing time, I hustled the Aston along the winding and hilly back roads, and even drove across a beautiful old covered bridge without stopping for a photo. Unheard of! But I had to stop in the Mount Cuba Historic District to get a look at the (somehow) surviving 1784 Speakman’s Saw Mill. Wooden buildings of this vintage, especially without siding, seldom last so long. While nosing around, I also spotted this old stone gristmill directly behind the sawmill. Although it postdates the sawmill, it was in nowhere near as good condition. The millrace ran directly between the two mills, but there was no sign of the water wheel. I later learned that the mills were run by the Speakman brothers until the early 1870s, with one sawing and the other milling grain. As I crossed Owls Nest Road, I spotted what I later learned is the Walnut Green School. Opinions vary as to its date of construction, ranging from 1780 to 1832, but most sources agree that it is the oldest surviving schoolhouse in Delaware. The original building is the end closest to the camera; it was expanded to double its original size in 1919 to accommodate the growing population. Inside, it is one large classroom. The school’s condition deteriorated, and its outside well became contaminated, with the result that the Walnut Green School closed in 1947. It is now a private residence. I suspect that many a game of Annie Over was played here, back in the day. I found this 1889 building in the hamlet of Montchanin, Delaware, but I was more interested in the other side. This was the railroad station for many years (now a lawyer’s office). The town was named for Anne Alexandrine de Montchanin, who was the grandmother of Éleuthère Irénée du Pontde Nemours. I sensed that I might be getting close to my primary destination! Despite it being mid-November, there were still some pretty colors on display. I finally arrived at the Nemours Estate at about 3:30—just enough time for a tour before the 5:00 PM closing time. The aforementioned E.I. du Pont (1771-1834), after emigrating from France and trying several different business ventures in the U.S., finally hit it big with his gunpowder factory at Brandywine Creek. He had studied chemistry in France, apprenticing under the “father of modern chemistry” Antoine Lavoisier. In America, he quickly realized that the low quality of the available gunpowder was a result of poor refining of saltpeter. His factory went on to supply 4 million barrels of gunpowder to the Union Army’s needs during the Civil War, and his descendants expanded DuPont into one of the largest and most successful U.S. businesses ever. In 1909, Alfred I. du Pont (a great-grandson of E.I. du Pont) decided to build a mansion as a gift for his second wife, Alicia. 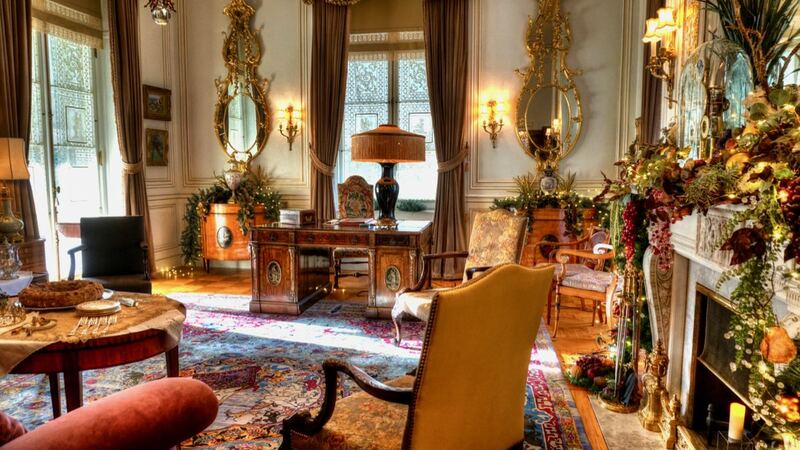 She was enthralled with all things French, so Nemours was modeled on a French country château. It was completed in 1910, with 47,000 square feet of space and 77 rooms. As I rode from the visitor center to the estate, the driver pointed out the jagged shards of glass that were imbedded in the stone wall surrounding the estate—mirroring the French style once again. The estate became part of Alfred’s Nemours Foundation, along with children’s hospitals in Wilmington, Delaware and Orlando, Florida. Needless to say, the Nemours mansion is quite a sight. The estate also features the largest formal French gardens in the U.S. Even in November they are quite a sight. I particularly admired the main staircase. This is the “writing room,” if I remember correctly. This chandelier in the dining room originally hung in Schönbrunn Palace, the girlhood home of Marie Antoinette. Speaking of whom, this elaborate clock was made as a present for Marie Antoinette. As fate would have it, she was executed by guillotine during the French Revolution before she could receive the gift. Did I mention that E.I. du Pont and his father Samuel du Pont supported the Revolution but were still arrested and threatened with execution? After spending time in La Force prison in Paris, they decided that emigration to the new United States was a wise idea. E.I.’s mentor, Antoine Lavoisier, was not so fortunate. He was guillotined in 1794. Alfred du Pont had quite a “man cave” in the basement of his mansion. This riding machine was part of the exercise room. Although I examined it for quite a while, I couldn’t figure out the motions that would be produced by its several electric motors. Alfred’s bowling alley also featured a hand-cranked movie projector. With the sun starting to set, and the estate starting to close, it was time to catch the van back to the visitor center. But not before admiring this gate, which was once owned by the Empress of Russia. Many visitors to the Nemours Estate likely conclude that either Alfred I. du Pont was one very lucky fellow or he was just an unworthy trust-fund baby, ripping off society at large. Truth is always more involved than any jumped-to conclusion, as illustrated in this instance by R. Walck’s very interesting blog post The Sad Life of Alfred I. du Pont. The photo is of Alfred and Jessie du Pont, his third wife and—finally—the true love of his life. Was it my imagination, or was the Aston Martin relieved to see me when I returned to the parking lot? We set off for the nearby Charcoal Pit Diner in north Wilmington, where one of us had an excellent dinner. From there, it was an easy 90-mile jaunt back to Catonsville and home. The total round-trip miles were 224, and total driving + looking-around time was 11 hours and 16 minutes. The Aston ran flawlessly and provided great driving enjoyment throughout. And the door locks even worked properly, each and every time! I can’t think of a better way to go searching for history, scenery, and assorted adventure. PS: Unless otherwise noted, historical photographs are courtesy of the Library of Congress, the National Register of Historic Places, or Wikipedia.